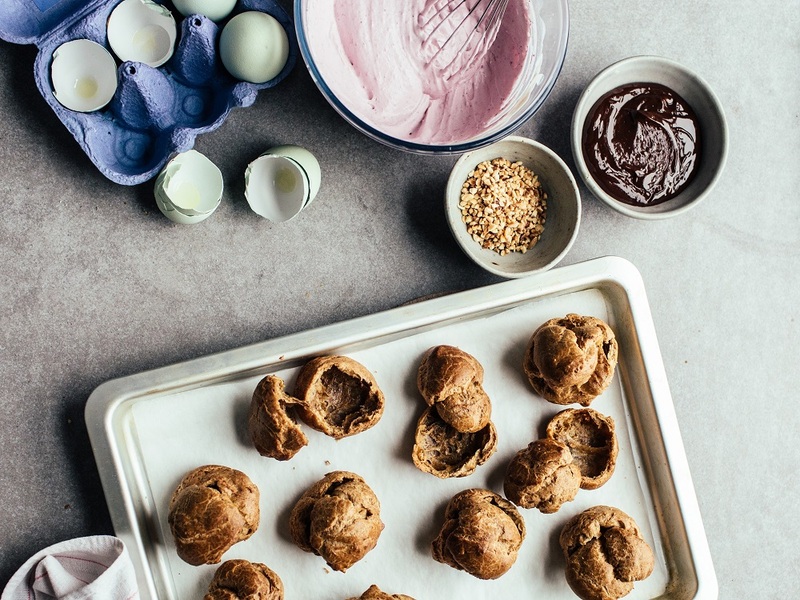 Heritage Breeds And Izy Hossack’s Blackberry And Chocolate Choux Puffs. Fancy making some of these; Heritage Breeds And Izy Hossack’s Blackberry And Chocolate Choux Puffs? Recipe by Izy Hossack for Heritage Breeds. 1. Preheat the oven to 220C, line a baking sheet with baking paper. 2. In a medium pot, heat the butter, water, salt and sugar over a medium heat until the butter has melted and the water is boiling. Take off the heat and immediately mix in the flours, then stir vigorously to get a thick paste. Keep stirring until the dough is smooth and comes away from the sides of the pot. 3. Let the mixture cool for a minute or two. Meanwhile, crack the Heritage Breeds Copper Marans eggs into a small bowl or jug and beat together with a fork. Drizzle a bit of the beaten egg into the pot and beat it in until smooth. Repeat until you’ve mixed in all of the egg. 4. Scoop the mixture into a piping bag without a tip (or use a mechanical ice cream scoop or a tablespoon). Pipe or scoop the mixture onto the baking paper into 3cm wide blobs (you should get about 10-12 of them), spacing them about 2-3cm apart. Use a wetted fingertip to smooth the tops of each blob. 5. Put the choux into the hot oven then turn the heat down to 200 C. Leave to bake for 18-20 minutes – they should have puffed up but will still be soft. Turn the oven down to 180 C and leave for another 10-20 minutes until the buns are slightly darkened on top and feel dry. As soon as you take them out the oven, cut each bun in half horizontally to let the steam out. Leave to cool on a wire rack. 6. Meanwhile make the filling: Blend 150g of the blackberries with the sugar and pass through a fine mesh sieve to remove the seeds – discard the seeds and keep the juice. Whisk the 150ml of double cream until you get soft peaks. Gently fold in the blackberry juice and yogurt. 7. For the chocolate ganache: Heat the remaining double cream and the 20g of butter in a small pot over a medium heat until gently steaming. Remove from the heat and add the chocolate to the pot. Set aside for 5 minutes so the chocolate melts then stir until smooth. 8. Fill the base half of each choux bun with blackberry cream. Top with a halved blackberry (from the reserved 50g). Dip the top half of the bun in the chocolate ganache then sandwich onto the filled base. Sprinkle with chopped hazelnuts and either serve immediately or leave. Heritage Breeds And Izy Hossack’s Blackberry And Chocolate Choux Puffs. Recipe by Izy Hossack courtesy of Heritage Breeds. Heritage Breeds Cranberry Meringue Roulade. "Creative Sunday And A Monday Link Up"
"A Day In The Life Of Mollie The Collie: It’s A Tough Life Being A Dog"